For the past year I have increased the amount of yogurt that I consume. I have always loved our various types of Borani, vegetables mixed with yogurt. 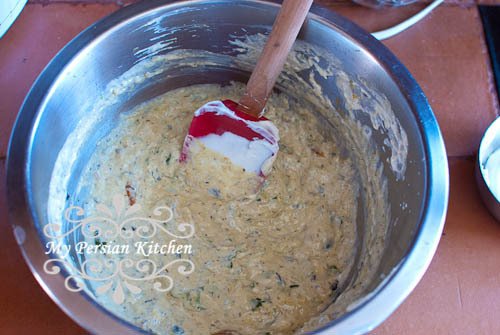 A while back I decided to experiment with Zucchini Borani, hence today’s post for Borani-e Kadoo. I have to say that I have completely fallen in love with it and it’s a nice change from the regular Eggplant Borani. Sunday was the Summer Solstice. Every summer I tell myself that I am going to use my grill often and experiment with new recipes. Today’s post is one of my first experiments towards my grilling goals! I am happy to say that recipe is all cooked on the grill. 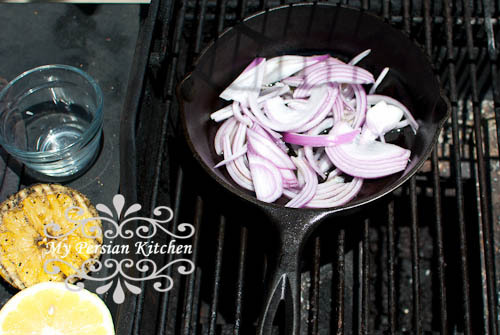 In fact, I not only grilled the zucchini, but I also used a cast iron skillet to sauté the onions on the grill. 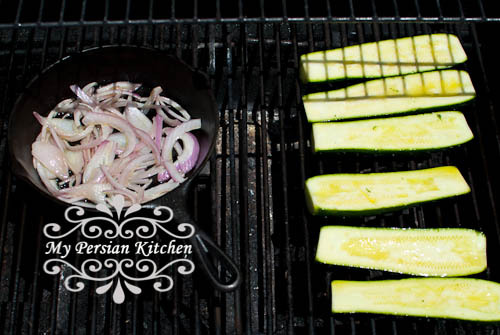 If you don’t have an outdoors grill, the zucchini can be easily grilled on the stop top grill, or simply roasted in the oven until tender. 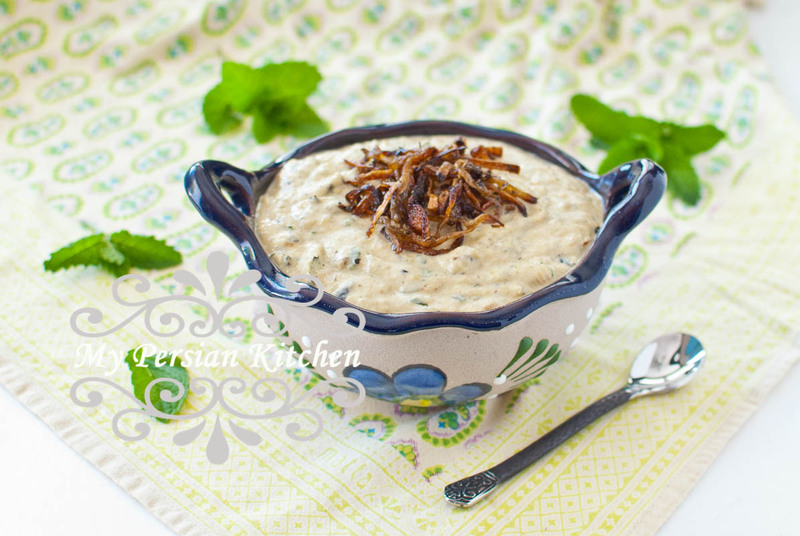 This borani is perfect with slices of Lavash bread, Pita bread, or even Pita chips! 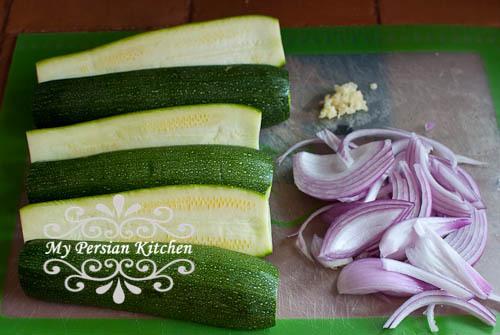 Cut zucchini in half length wise. Slice onions in thin half moons. Mince garlic and set aside. Add 2 tablespoons of olive oil to a shallow dish and season with a pinch of salt. Add zucchini and give it a stir making sure that the zucchini slices are completely coated with olive oil. Clean grill and place cast iron skillet on top of the grill on medium flame. Close lid and allow the cast iron to warm up for two minutes. Add olive oil and onion slices. Close lid and sauté onions for about 5 minutes. 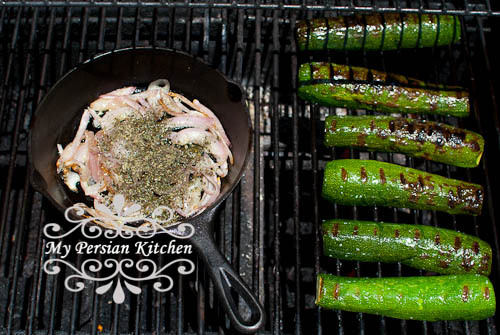 Add zucchini and allow to grill with the lid closed for 8 to 10 minutes on medium low heat. Every few minutes stir the onions. Flip the zucchini over. Add garlic and mint to onions, then stir. 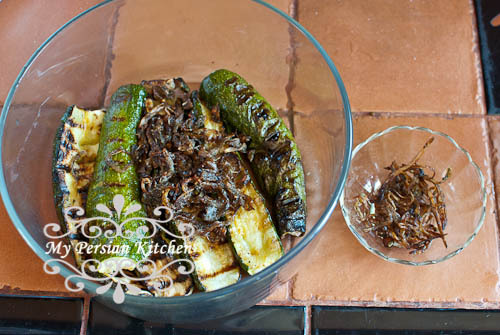 Continue cooking until onion becomes golden and the zucchini slices are cooked all the way through. Remove 2/3 of the onions and set aside. Continue cooking the one third on low heat until it become crispy, about 10 minutes longer. 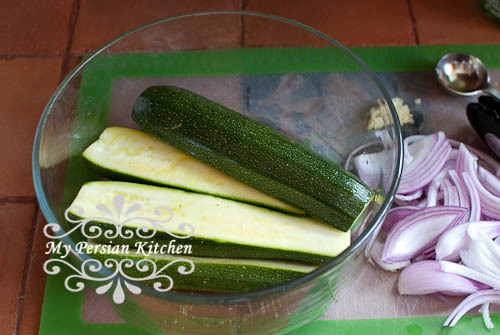 Allow the zucchini to sit for about 10 minutes so that the juices are released. Drain juices. 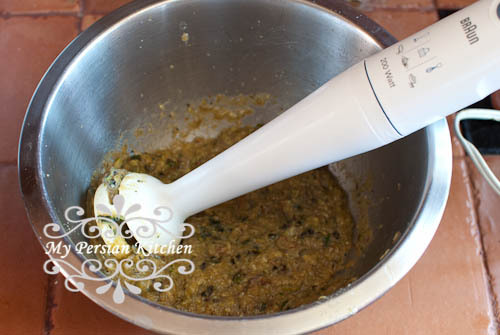 In a mixing bowl use a hand blender to mash the zucchini and golden onion. Add yogurt and mix well. Adjust seasoning as needed by adding salt and pepper.